Starbucks aims to bring its products to Chinese consumers through new digital and physical means, including delivery. The company saw sales decline at existing China stores in the last quarter. Starbucks is leaning heavily on Chinese commerce giant Alibaba Group as it places a big bet that China’s growing middle class will become major coffee drinkers – a supposition that the coffee giant’s latest quarterly performance cast in doubt. The two companies announced a series of joint initiatives late Wednesday that Seattle-based Starbucks hopes will accelerate growth in China. The moves come a year after Starbucks agreed to buy out a joint-venture partner for $1.3 billion to take full control of its China business, which executives have touted alongside the U.S. as a key region for future growth. But last week, Starbucks reported that sales at stores open 13 months or more in China fell 2 percent in the company’s fiscal third quarter, a stark reversal for what has been a consistent growth engine. Executives said it was a temporary blip related to its continuing expansion there as customers shifted purchases to newly opened stores. They also pointed to new low-price competitors offering coffee delivery to explain the disappointing performance. With Alibaba, Starbucks will offer its own delivery option as it extends its reach to Chinese consumers in digital and physical form, piggybacking on the strategy Alibaba is using to expand from its roots as an online marketplace to a multifaceted retail empire with many similarities to Amazon. 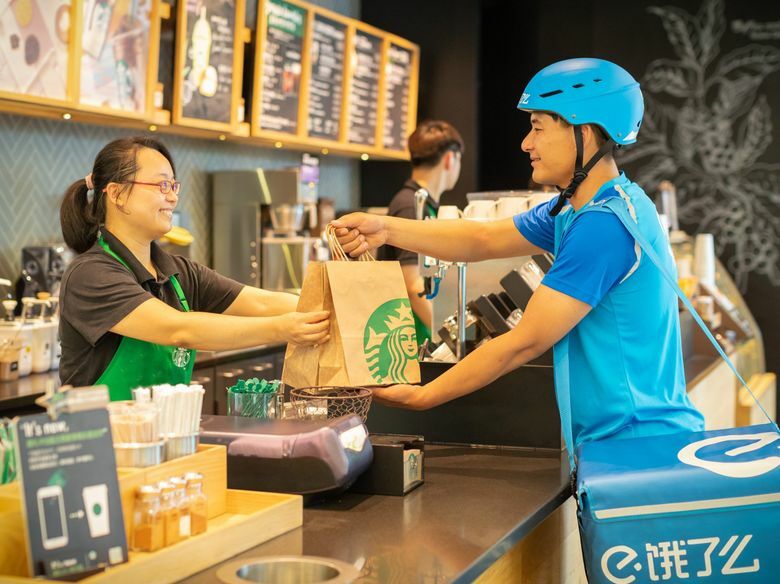 Using Alibaba’s recently acquired Ele.me delivery service, Starbucks will begin offering on-demand delivery from 150 stores in Beijing and Shanghai in September. Some 2,000 Starbucks stores in 30 Chinese cities are expected to offer delivery by the end of the year. 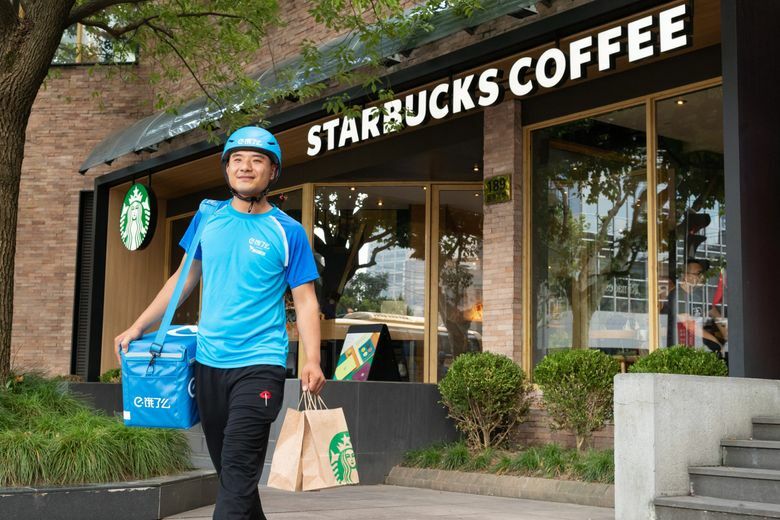 Alibaba’s supermarket chain Hema will host “Starbucks Delivery Kitchens” to augment delivery from nearby Starbucks stores, while allowing store employees to focus on in-store customers. This effort will also begin in September with Hema stores in Shanghai and Hangzhou. Also, the companies are developing a “virtual store” for digital ordering and gift-giving across Starbucks’ own mobile app and Alibaba properties including Taobao Marketplace, an online shopping destination with a large social component; payment service Alipay, which claims 520 million users; and branded merchandise seller Tmall. Starbucks’ China ambitions are buoyed by the country’s growing affluence and urban middle class, eager to spend on name-brand goods and services. But the company, which entered the market in 1999, is also trying to transform tastes in what is perhaps the world capital of tea. “For nine consecutive years we lost money in China,” Howard Schultz, Starbucks former executive chairman, told shareholders at the company’s annual meeting in March. “And there were so many people who doubted whether in a tea-drinking society we could break through. … Not only have we broken through, but China is going to be the largest market in the world for Starbucks. In its announcement Wednesday, Starbucks said coffee consumption in China has almost tripled in the last four years, citing U.S. Department of Agriculture and International Coffee Organization data. Starbucks’ own store count quadrupled from 800 to 3,200 in the last five years – including one of its flagship Roastery stores, opened in Shanghai last December. It is on pace for more than 6,000 stores by the end of its 2022 fiscal year. Starbucks China CEO Belinda Wong said at the shareholder meeting that the country’s middle class was expected to reach 600 million people by 2022. But the coffee habit in China has yet to take hold on anything approaching the scale in the U.S.
Chinese people drink less than half a cup of coffee, per capita, per year. In the U.S., that number is more than 300 cups, she said. “Lots of opportunities,” she said.